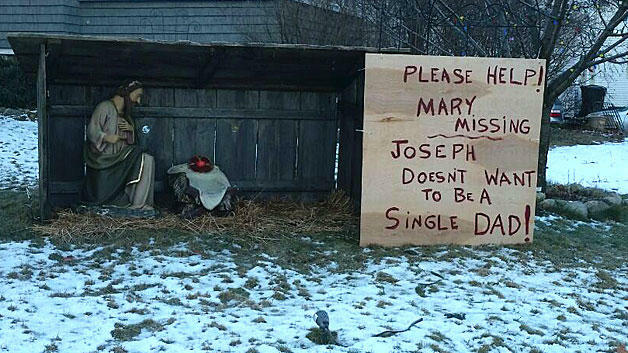 MANCHESTER, N.H. --The owners of a nativity scene have a message for whoever stole Mary from their yard last week. Shirl Kula says she and her husband have put up the set almost every Christmas in the 16 years they’ve lived in their home, and they consider it a gift to the neighborhood. Kula says she’s not looking to punish whoever took Mary; she simply wants her back. Jesus isn’t in his cradle, but he hasn’t been stolen. Kula and her husband wait until midnight each Christmas to put him out. Nativity scenes in New Hampshire have had a tough holiday season this year, CBS Boston reports. Just last week, a baby Jesus which had been stolen from a town nativity scene in Salem, N.H., was found and returned.